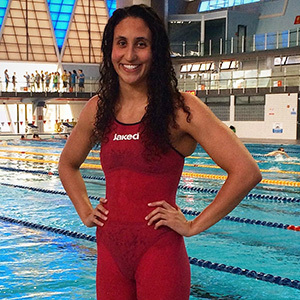 Andi Murez, from Venice, Calif., has been living in Israel and represented the country for the 2016 Rio Olympic Games in the 50-meter and 100-meter freestyles. She holds the Israeli national records in the 100 and 200 meter freestyles. She was one of the top freestyle swimmers in Stanford University history. Murez swam key legs on two NCAA Championships freestyle relay teams in 2012 and finished as a six-time NCAA All-American (2010-2013). She ranks in the Stanford all-time top 10 in the 50-meter, 100-meter and 200-meter freestyles and ranks in the top 5 all-time on Stanford’s 200-meter and 400-meter freestyle relay teams. She graduated with a degree in Human Biology in 2013.